« Canon 400D waiting on a tiger…! 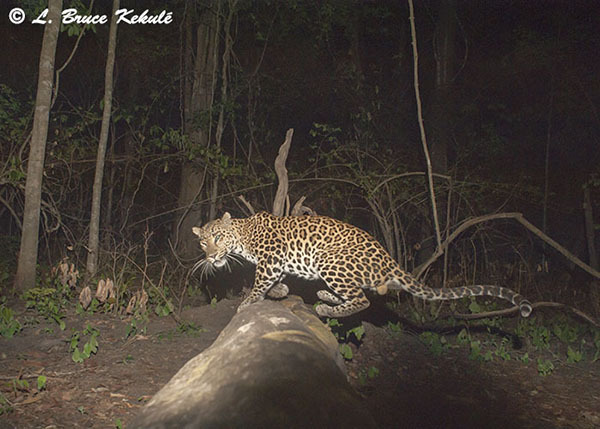 Nikon D700 catches a male leopard on one paw…! Male leopard on one paw….shot #2. Male elephant – the flash destroyer. Evert year, forest fires occur in Thailand’s ‘Western Forest Complex’ during the dry season usually started by the human population living around the protected areas. Occasionally, lightning ignites fires but this natural phenomena, is less frequent. Stray cigarette butts also account for many fires. 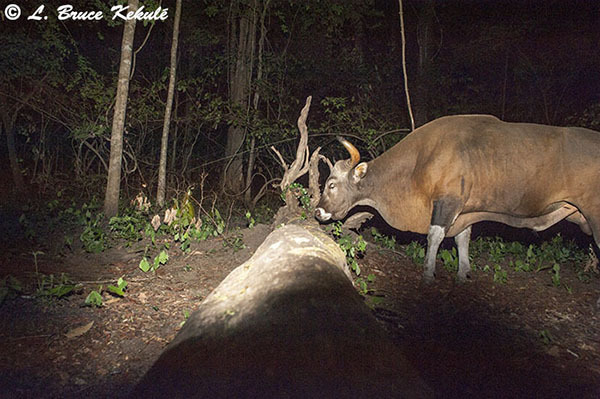 For the most part, local poachers start them to allow long distance spotlighting during the night. With the brush gone, they are able to see the reflection in the eyes distinctly (usually deer) with their headlamps. Occasionally these fires are fierce and any camera trap left in the forest during this time will likely be destroyed. I always move my cams to evergreen forests from about February through to April that normally do not have fire, and this year was no different. 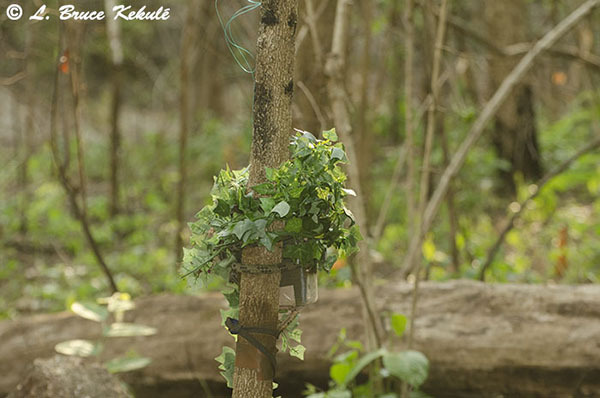 But as soon as the first monsoon rains come in mid-April, the forest is safe once again for camera trapping. With the first good rains through, I decided to setup my Nikon D700 back on the log. This time the cam is using a hardwired SSII sensor (Snapshotsniper.com) with a 10-meter cable setup in the tree stump apposite the cam. Also, a third flash was added and installed above the cam’s ‘elephant proof ‘ box. 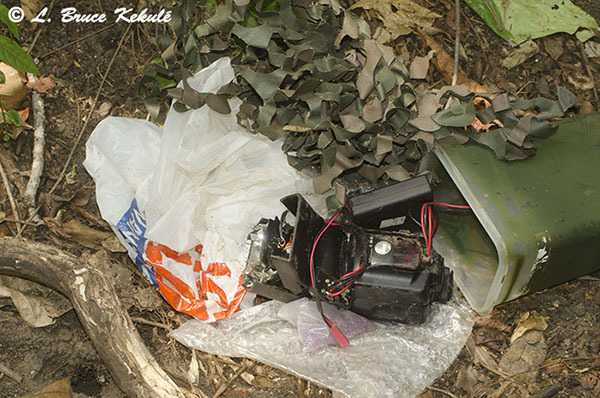 However, the ‘third flash’ is now history as a young tusker found it and turned it into rubble (below) but the cam, the sensor and two other flashes survived. It was great to see this male leopard cross over the log. The first image is a good record shot but the second one is really something special catching this mature predator on one paw with the other three in mid-air. Also, the reproductive organ is sharp and just hanging there with its tail is balancing the big cat. He looks like he is winking at the cam. 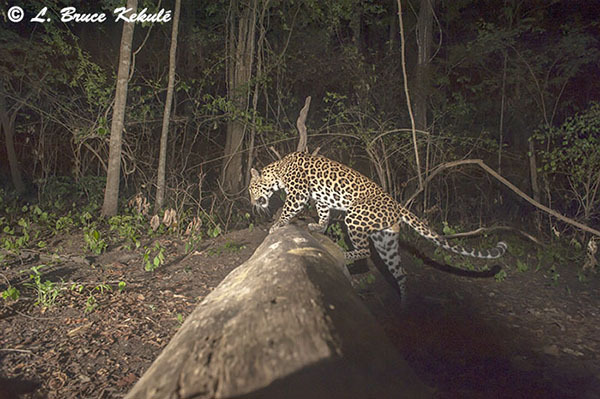 Once again, within two shots, the leopard turned his head to see what the flash was all about just like my tiger in late January 2014. The speed and reaction time of these felines is legendary and it doesn’t get any better…! 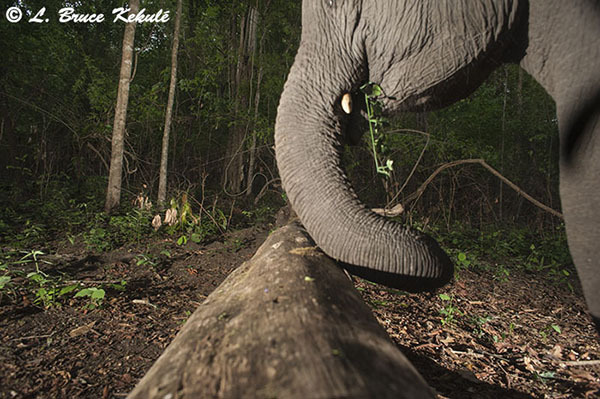 I also got the elephant that destroyed the third flash plus a banteng bull that stopped short but did not cross over. All in all, it was a great start to a new season at the ‘tiger log’. The full-frame D700 firing off a two-shot burst is in its element with a 28mm lens but now with only two flashes thanks to the forest giant. I have installed a 35mm lens this time to see what a tighter crop will do. Enjoy..! 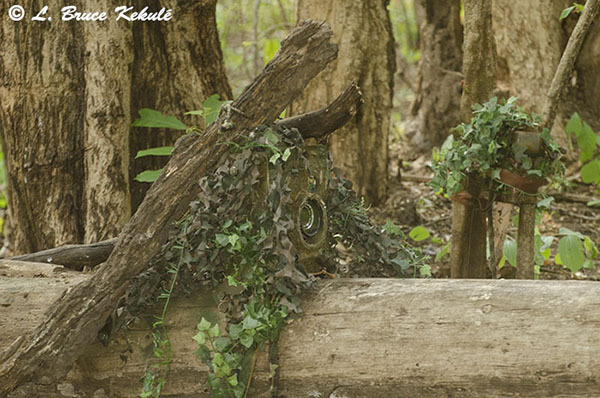 Nikon D700 setup on the log. Hardwired external SSII (Snapshotsniper.com) sensor. Hardwired Nikon SB-28 flash setup. D700 settings: ƒ8 – 1/125 at ISO 400. Edited in Adobe Camera Raw. 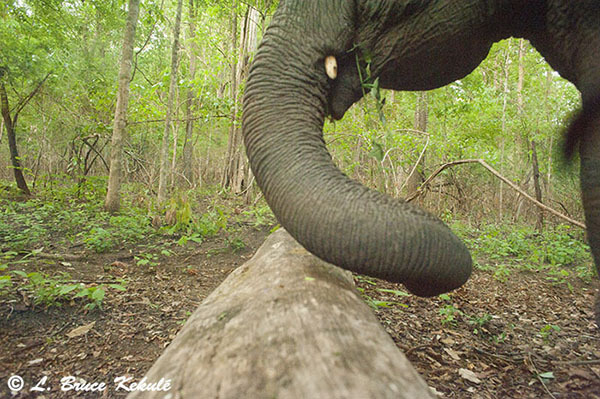 Elephant and banteng bull: full-frame. 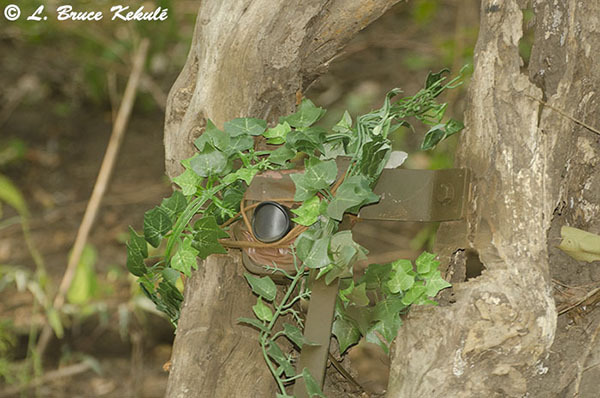 This entry was posted on Monday, May 5th, 2014 at 8:14 pm	and is filed under Camera Trapping. You can follow any responses to this entry through the RSS 2.0 feed. Both comments and pings are currently closed.